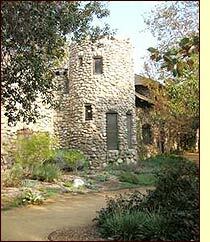 El Alisal - Charles Lummis' historic home in Los Angeles - is hosting a very special open house on December 11 from 3 to 6 pm. There is no charge, although an RSVP is requested by December 2 (call 323.222.0546). 200 E. Avenue 43, Los Angeles CA 90042 (Highland Park). Map & directions here. Okemos, Michigan: Schaberg House, an especially well-preserved and unaltered example of Wright's Usonian style built in 1950, will be sold off along with its accompanying large parcel of land on November 30. Oak Brook-based Inland Real Estate Auctions will handle the auction; bidding will begin at $595,000, and a deposit of $75,000 is required to bid. 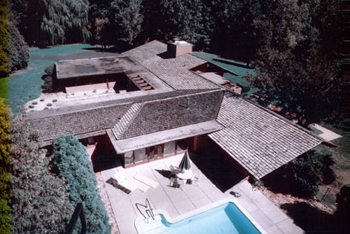 Schaberg House is a 3,800 sq ft, 5 bed, 4 bath home which has had next to no alteration from Wright's original drawings. One small addition was made in 1964 by Wright's apprentice, John Howe; its pristine and original condition could make seeking landmark status quite easy, should the new owners wish to pursue this option. Frank Diliberto, Inland Real Estate's president, says that "Wright enthusiasts have turned out in vast numbers to consider bidding on the two Wright homes we've auctioned. They are finding that the auction process is a tremendous way to establish quickly the true value of Wright homes, which because of their uniqueness have long been extremely hard to value. This has strong and increasing appeal to Wright homeowners, who often have to market their homes for years on the conventional market in order to identify the value that the auction establishes in just one day." The five-acre site is almost completely surrounded by 150 acres of natural woodland; while the site may be particularly attractive to developers, nobody is suggesting that the house itself, which is in excellent condition, be removed or torn down to make room for other structures. Berkeley's Panoramic Hill neighborhood is now a designated Federal Historic District. This neighborhood, full of homes - large and tiny - overlooking the UC Berkeley campus, looks down (as the Berkeley Daily Planet notes in their article on the subject) on Berkeley's first entry on the National Registry of Historic Places, a tiny laboratory in room 307 of Gilman Hall where Wahl, Seaborg and Kennedy discovered plutonium. The neighborhood boasts numerous well-maintained Craftsman homes, including a number of famous "Berkeley Brown Shingles." Local residents, under the aegis of the Panoramic Hill Association, applied to join the Register after they learned of the University's plan to add extremely bright night-time lighting to its stadium, which would have drowned out much of their expansive night-time view of the Golden Gate and San Francisco. UC Berkeley's plan must now be reconsidered in light (no pun intended) of its impact on nearby areas, specifically the new Historic District. Homes in the neighborhood include structures by such architects as Bernard Maybeck, Ernest Coxhead, Julia Morgan, John Hudson Thomas and William Wurster. BAHA - the Berkeley Architectural Heritage Association - held a house tour on Panoramic Hill last year, which took advantage of the hilly neighborhood's many hidden walking paths. Here are a few pictures and some press coverage from their 2005 tour ; more pictures - including some of a wonderful Walter Steilberg 1930 cottage - taken by Ron Sipherd, are up on his site. note: We apologize to Daniella Thompson, whose photograph we used without permission. Harry Wakefield, the Editor of Mocoloco.com, alerts us to Ted Wells' Living Simple: an "audioblog" (each entry is actually a podcast) devoted to a wide range articles on both humanist and modernist architecture and design issues. In between the Richard Neutra and Bradd Pitt-on-architecture bits is an excellent three-part tour of the Greene & Greene in Long Beach exhibit (October 2005 through October 2006) at the Long Beach Museum of Art. I think this may be the first Arts & Crafts podcast! note - from Ted's page, simply pick the "direct download" link at the bottom of each entry, or use that URL in iTunes or other audio player. The sound quality is quite good. Jeffrey Hunt's work is a fusion of Japanese and Craftsman styles and mixes a variety of woods. The long horizontal lines, grids and rigid angles of the work make it especially complementary to a Prairie home (like this Frank Lloyd Wright-influenced chair), although his work might be the taste of anyone interested in Asian-influenced Arts and Crafts. His more angular modern work is also quite attractive. Hunt lives and works in Nevada City, a small town in the foothills of the northern Sacramento Valley. the Fort Wayne Journal Gazette takes a look at Thom and Leslie Beers' "neo-Japanese Craftsman" house and the art collection it contains. Have you seen an article on historic home or A & C related issues in your local paper? Let us know! Last year, Keith Wiesinger of the Wilson Crafts Guild had the opportunity to see the Byrdcliffe traveling exhibit and wrote up an excellent review for us. I was recently given a copy of the book Byrdcliffe: an American Arts & Crafts Colony, produced by the Herbert F. Johnson Museum of Art as a catalog for the exhibit, and have spent the past few days reading it. To call it simply a catalog of a museum exhibit, though, is to do a disservice to the book and its authors. An ethnography of the Byrdcliffe community, a personal history of its founders, and a very thorough meditation on what drew them together and the philosophy that informed their work - that's a far better description of this book. Editor Nancy Green is the Senior Curator at Cornell's Johnson Museum, and she's assembled a number of extended essays here: a very complete history of Byrdcliffe, by Tom Wolf; her own essay on "the Reality of Beauty," tying Whitehead to Ruskin, Morris and their reactions to Victorian culture; Heidi Nasstrom Evans' inquiry into the life and work of Jane Byrd McCallWhitehead, the cofounder of the Byrdcliffe school and backbone of the community itself; Robert Edwards' excellent and well-illustrated dissection of Byrdcliffe furniture; Tom Wolf's general discussion of art at Byrdcliffe; a catalog and examination of Byrdcliffe ceramics by Ellen Denker and a very thorough analysis of Byrdcliffe architecture and its relationship to the natural landscape of the Catskills. 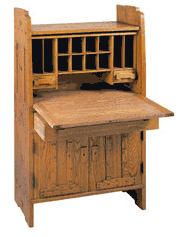 I myself had seen Byrdliffe furniture before, but had no knowledge of the utopian community that spawned the movement, or the art school that generated the simple and subtle Byrdcliffe glazes and White Pine(s) pieces. The beautifully rustic handpainted tiles, bowls, vases and other usefully everyday objects are relatively rare today, of course, and there were never many made to begin with, but I was still surprised that I didn't know much at all about such an important part of American A&C ceramics history. The book is well-illustrated but is by no means a "coffee table" picturebook; while it's more than a catalog, it is a catalog, too, with pages upon pages of accessioning data relating to the hundreds of items in the exhibit and their provenance. The essays are not too dense to pick up and read for pleasure, though, unlike many such books, and I think anyone interested in the roots of American A&C - or looking for new inspiration in their own work - will find quite a bit worth reading and looking at in what has been until recently a relatively forgotten corner of the A&C world. I'm glad that Byrdliffe is getting its due in the publication of this book and the production of the exhibit, which I suggest you see when it comes to a museum near you. My only problems with the book are aesthetic. Perhaps it would have been slightly more accessible if it were a bit more of a "coffee table" gift book. I don't think the essays should be reduced in length, but higher quality printing, better paper (the softcover shows wear within a few hours of reading), a bit more editing of the photographs, and inclusion of more of them - and larger use of the best! - as well as a less-dense layout would have improved it tremendously. However, I hope that doesn't dissuade anyone who is interested in the philosophical underpinnings of the movement and the history of A&C in this country from reading the book; it provides a glimpse into the transferrence of English A&C to American that is missing (obviously) in the recent catalog of the V&A show, and takes a backseat to the objects themselves in the catalog of the LACMA show. It is very much worth reading. Founded in 1979, the Johnson Partnership is located in Seattle and does both restoration / remodel jobs as well as new residential projects throughout the Northwest (as well as commercial and preservation work). From the type used on the opening page of their website, I could tell that A & C aesthetic meant a lot to them; the combination of Asian and Craftsman influence in their work is particularly refreshing to see from a new home builder! Their new site is full of downloadable PDFs profiling particularly noteworthy projects, as well as a few video walkthroughs, and is definitely worth checking out. Almost every single one of their projects reflects a true dedication to A&C ideals. The level of detail in their woodwork is refreshing - it's as if cabinetmakers decided to build houses, which isn't far from the truth; architectural principal Larry Johnson is one of Seattle's most knowledgeable people when it comes to Arts & Crafts design, and architect Howard Miller is a furniture designer, woodworker and ceramacist (who also lists his skills as "enthusiastic husband" - glad to know they have a sense of humor, too). What makes their skillset and focus especially interesting to me at least is that Lani Johnson, the environmental planning principal, brings preservation and landscape to the forefront - everything they build is situated so precisely in the landscape - just as it would have been for the founders of the movement. Their respect for the fidelity of the original architect's vision in a remodel job is equal to the respect they have for the land a new house will be built in, and that is impressive when so many builders don't consider the latter at all. This 12-page PDF is excerpted from Taunton's Updating Classic America: Bungalows by M. Caren Connolly and Louis Wasserman. It details a particularly interesting remodel / restore of a Seattle bungalow with great external stone features and a terrific kitchen. CSS & HTML help needed! Needed: someone with more than passing acquaintance with CSS, Movable Type / Typepad tags and HTML to implement our redesign. Email me if you are interested or know someone who might be - thanks! Christian and Christen Gladu, Bungalow Plans, Gibbs Smith, Salt Lake City, 2002. The second coming of the arts and crafts movement brings with it a revival of many of the aspects of original era. In Bungalow Plans, Gladu and Gladu continue the tradition of disseminating house plans originally promoted by pioneers like Gustav Stickley who, through magazines and catalogs, offered the broad middle class architectural drawings - plans of simple, affordable, well designed homes - that incorporated the Arts and Crafts ideals of John Ruskin and William Morris. The Gladus offer 25 bungalow plans in their book, each accompanied by photographs, text, and information on designers and builders. Their aim is not only to show different kinds of homes - everything from 600 square foot garlows (not yet in my on-line dictionary, but apparently garage and other "accessory" units) to 4000 square foot "ultimate" bungalows - but to provide practical advice on adapting stock plans to modern, especially environmental, concerns. 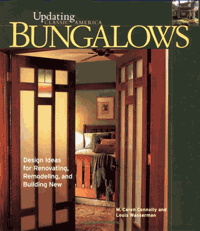 Introductory chapters put the plan book approach in historical perspective and offer useful context on "bungalow anatomy" and building costs. A section on resources concludes the volume. Richland, WA sits along the Columbia River, on the historic Lews & Clark trail. The town, incorporated in 1910, was mostly razed by the US Army to make room for a new bedroom community for Manhattan Project workers at the nearby Hanford Nuclear Reservation. The population soared from 300 to 25,000 in July and August 1943; unfortunately, this runaway growth required the destruction of the vast majority of the town's existing structures, and almost all of its residences. The army knocked down the homes to make room for new, "modern" tract homes, but a very few of the original houses - mostly built between 1907 and 1935 - were saved from the wrecker's ball. Most of those that still stand are Craftsman or inspired by Craftsman and Prairie styles; Jeremy Wells of the East Benton County Historical Museum has put together photographs of and a bit of commentary on these structures. The new planned community of Richland was designed in less than 90 days. Construction of new streets began on March 20, 1943, and the first house completed - a "B-house," one of the "letter houses" named in the convention used for the 26 new plans (A-Z) - was finished on April 28, 1943. After Maybeck's large family house on Buena Vista burnt down in 1923, it was never rebuilt, nor did he build another large house for his family. Instead, over the following years, he and his family built several cottages all in the same neighborhood, some on the site of his original house. Maybeck had purchased large parcels of land in the North Berkeley hills and 2751 Buena Vista was one of two houses, essentially the same design but rearranged to fit the site, that he designed and built during the depression to keep his staff and craftsmen working. Over the years, various family members moved in and out of their 8 different houses, all cotages except for "Hilltop" in Kensington. 2751, however, seemed to be the heart of the extended family, where Ben and Annie lived for several years and to which Wallen, Jacomena and the twins eventually returned. It embodies many of Maybeck's notions about what an ideal home should be; modest, free of adornment, well-integrated into its site, amidst the lush foliage and with views of the bay. The many decks extend the interior outside, the height of the living room, the arched beams and the floor-to-ceiling metal sash windows add drama, atmosphere and light. In more recent years, it has had a new foundation, drainage and retaining wall added (1998), a new furnace, electrical upgrades and a new roof and roof deck off the kitchen (2005). Jacomena wrote in her book, Maybeck, A Family View, that a workman told Maybeck "I believe you have put the house partly on the next lot," to which Maybeck replied, "Oh, well, move the lot line." This was finally done in 2004.
a small reading or coffee table (from Canadian Home Workshop magazine).